All participants must be accredited before the Meetings, and are strongly encouraged to register as early as possible to avoid delays. Participants are divided into different registration categories, described below. Please determine your category and follow the registration instructions for that category. The Registration Confirmation letter is an important document that will be needed to board the shuttles and to enter the Meetings Campus prior to picking up your Annual Meetings badge. We recommend you travel with or keep a copy on your mobile device. Guest registration is now closed. All Guests are subject to clearance and Guest accreditation is not transferrable. Private Sector: Representatives from financial institutions and banks, commercial enterprises, consulting, and contractor firms. Academia: University professors, researchers, faculty members, and students who have research and educational interest in the operations and affairs of the WBG/IMF. Documentation should be submitted with the application (an endorsement letter from the Head of Department or Vice Chancellor of the University) confirming status in the University and stating academic interest. WBG Guest or IMF Guest? : Guests may choose to attend the Annual Meetings as WBG Guests or IMF Guests, but may not apply as a Guest to both institutions. Submitting Guest requests at both institutions will substantially delay the processing of your application. Except for restricted and private events, Bank Guests will have access to Fund events, and Fund Guests will have access to Bank events. If you have any questions about Guest registration, please forward your inquiries to GuestRegistration@worldbank.org. CSO registration closed on September 7. No new requests will be accepted after this deadline. As in previous years, the IMF and the World Bank Group will host the Civil Society Policy Forum (CSPF) as part of the 2018 Annual Meetings. The CSPF serves as a platform for Civil Society Organizations (CSOs) to openly share their views and perspectives, while facilitating dialogue with IMF and World Bank Group staff, their peers, and other stakeholders on a wide range of topics. The 2018 Annual Meetings CSPF will convene in Bali, Indonesia from October 9-12. All CSO representatives interested in participating in the CSPF must obtain individual accreditation. This accreditation will also provide access to all the open events of the 2018 Annual Meetings. For purposes of registration, CSOs include non-governmental organizations, community groups, labor unions, indigenous people’s movements, faith-based organizations, professional associations, foundations, think tanks, charitable organizations, and other not-for-profit organizations. All other participants - such as representatives from the private sector, academia or governmental bodies - must apply for accreditation through the "Guests" or other relevant registration category. For questions about CSO registration please write to csoregistration@worldbank.org. If you have any questions about the Civil Society Policy Forum, please send an email to CivilSociety@worldbank.org or ngoliaison@imf.org. 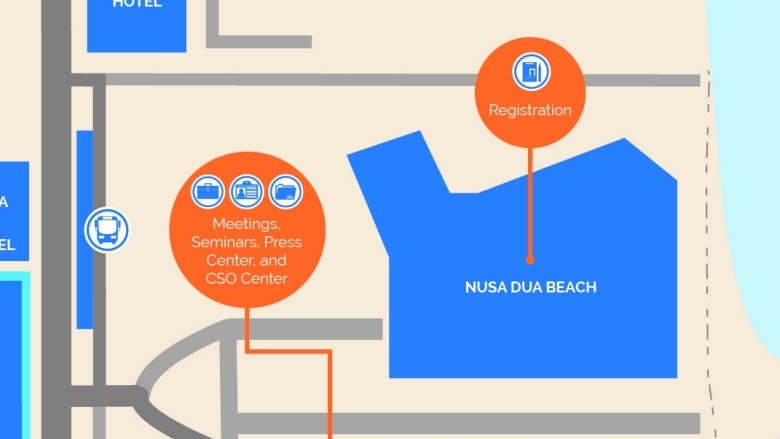 Annual Meetings attendees may obtain their badge at Registration Desks located in the Nusa Dua Beach Hotel. Registration will be open from Monday, October 8 until the Meetings close on Sunday, October 14, from 8:00 am to 5:30 pm daily (times subject to change). Facilities for onsite accreditation are very limited and onsite accreditation is not guaranteed. Walk-in registrations may not be accommodated.